Do you have acne-prone skin? Mainly blackheads and a few spots? Don't panic! Discover our anti-blackhead face care routine: an ideal routine to control and help eliminate spots with long-lasting results. Personalize your routine: for each step, choose the KERACNYL products that best suit your skin type. Daily cleansing care designed for oily and acne-prone skin, for the face and body. 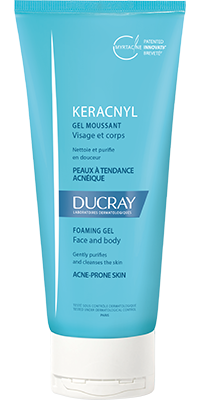 KERACNYL Foaming gel gently cleanses the skin and purifies deep below the surface. Can be used alone or in combination with acne treatments. Anti-biofilm (C. acnes) action from Myrtacine. You can't add more than two products by step. 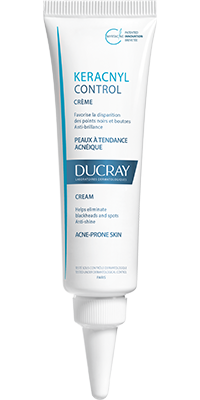 A product to control help eliminate spots and blackheads with long-lasting results. It unblocks pores and reduces excess sebum. Anti-biofilm (C. acnes) action from Myrtacine. Can be used alone or in combination with medicinal treatments. 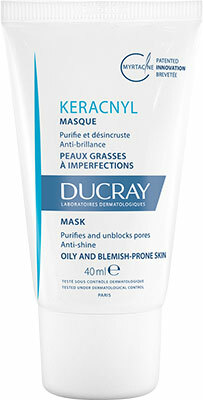 KERACNYL Mask is a purifying skin care product for oily, blemish-prone skin. It absorbs, unblocks pores, exfoliates and refines skin texture.